What a fun fantasy read! 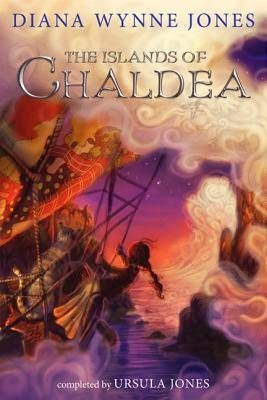 That is basically the sum of all my thoughts on The Islands of Chaldea, a book started by Diana Wynne Jones and finished by her sister Ursula Jones after her death. I’d never read a book by Diana before, but had heard pretty strong positive things about her writing. It’s why I decided to take the plunge with this novel, and I can definitely say it was worth my time. The story of The Islands of Chaldea is whimsical and imaginative. It’s the type of story I would’ve gotten lost in as a child, completely willing to go along with the flow and see where it took me. As an adult though, I had a harder time allowing myself a full immersion in this world and characters. The beginning felt slow, and I nearly lost interest in this story. But then Aileen, along with a couple of others, is sent on a quest that involves travel and magic and intrigue. I love a good quest! This is the part of the story that finally drew me in. Aileen and her companions travel to many different places, and have many strange (and sometimes dangerous) encounters. There was magic, and fantastical creatures, and hints of peril – and it was fun and exciting. The Islands of Chaldea was a great diversion for a couple of hours. Even though it’s clearly geared towards a younger audience, it’s still an enjoyable fantasy read. You've never read a book by DWJ before this one? Oh Alexa. YOU NEED TO READ HOWL'S MOVING CASTLE. Right this second. It's so good and I know you'll like it. That said, I have this on my Kindle and I am excited to read it. Maybe will get to it on the bus to BEA. THERE'S A SHIP ON THE COVER! I adore ships, both of the sea and love variety. Despite the cover, I don't think I'd actually pick it up if it weren't for your review, I'd just appreciate the outside. Now, I know I have to appreciate the inside because who doesn't love quests and fantasy?! This sounds like SO much fun to read. Thanks for sharing it!